Santa Cruz (The Holy Cross) began when Constantine the Great ‘s mother, Saint Helena of Constantinople, made a pilgrimage to the Holy Land returning with the original Holy Cross and other relics. The month starts in Puerto de Calderon, on the road to Celeya, the first weekend in May. Calderon is where the statue of the Lord of the Conquest was found after two friars were killed by the native Chichimecas (and how the neighborhood, Los Frailes, got its name). Puerto de Calderon has particular importance to the indigenous because the cross of the Lord of Conquest symbolizes the Chichimecas’ acceptance of the Catholic faith. From this, San Miguel de Allende became one of the world’s centers for worship of the Holy Cross. their gods were. (Plus a wood cross could be easily burned and, therefore, thought not powerful.) Soon the priests realized they needed crosses made of the same materials as the indigenous gods were. The sun and moon were featured in the arms of the cross reflecting the universe and promoting the concept of a single god. Often the crosses themselves were hollow, allowing the Chichimecas to place a small stone native god in the interior of the cross in secret. Soon each home was required by the ruling Spanish to have a cross on their family altar, and no other religious image. At this time began the painting of images on small metal surfaces representing personal stories of miracles and faith attributed to the holy cross. 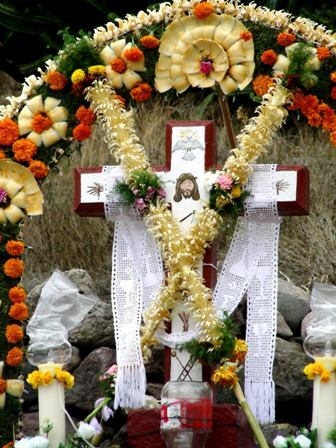 During May the oldest neighborhoods (Guadiana, Ojo de Agua, La Palmita and Valle de Maiz) each have their own venerations of the cross and celebrations. The first Sunday of month is in Guadiana because it is the oldest area of San Miguel. 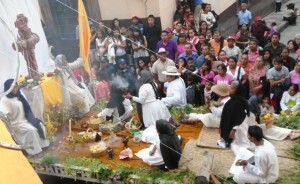 The second Sunday is in Ojo de Agua, the third in La Palmita and the fourth Sunday is Valle De Maiz. 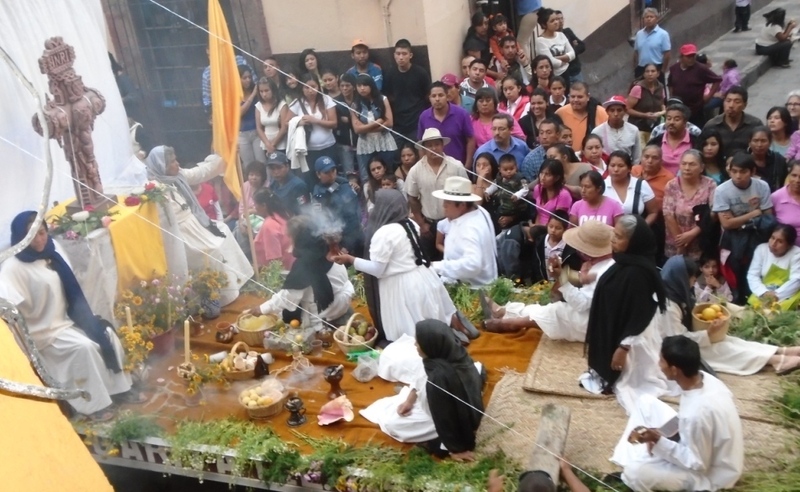 There are other neighborhood celebrations venerating the cross (including El Tecolote, El Chorro, El Charco and San Juan de Dios), but the oldest crosses are in the four oldest neighborhoods. The objective of the festivals is to give thanks for all the blessings received during the past year and pray for a good rainy season and harvest. Crosses were used by the Spanish is mark the boundaries of the early neighborhoods. Replicas of these cross still stand often featuring images that tell the Crucifixion story like a ladder, dice, rooster, spear, rope and chain, sponge with vinegar and the pitcher and bowl which Pilate washes his hands.